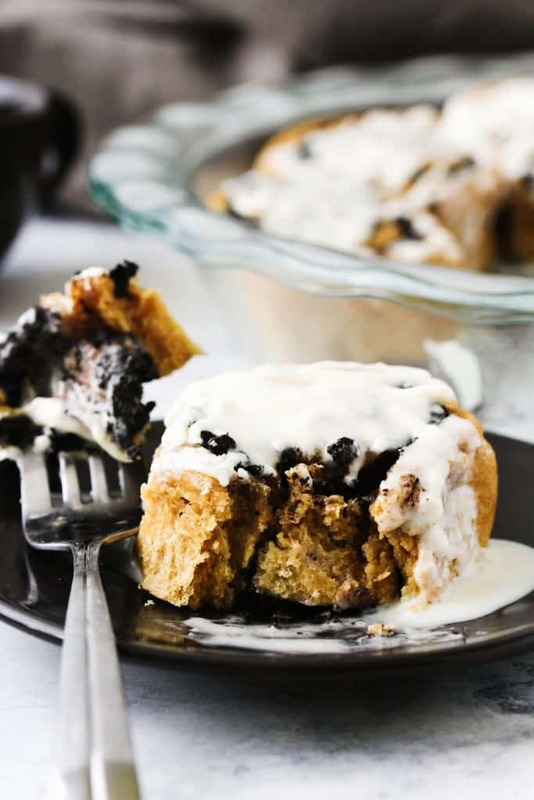 These vegan whole wheat chocolate cinnamon rolls are light and fluffy with a perfectly sweet, chocolatey filling, and are full of wholesome ingredients. This recipe for yeast raised dough is super easy and perfect even for beginner bakers! If there were ever words that were meant to be together they are CHOCOLATE. CINNAMON. ROLLS. 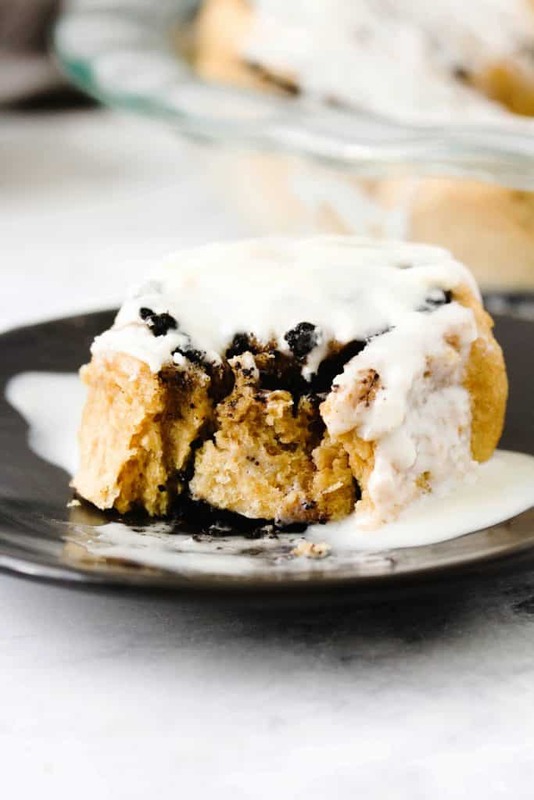 And if you want to get real specific, how about vegan whole wheat chocolate cinnamon rolls. 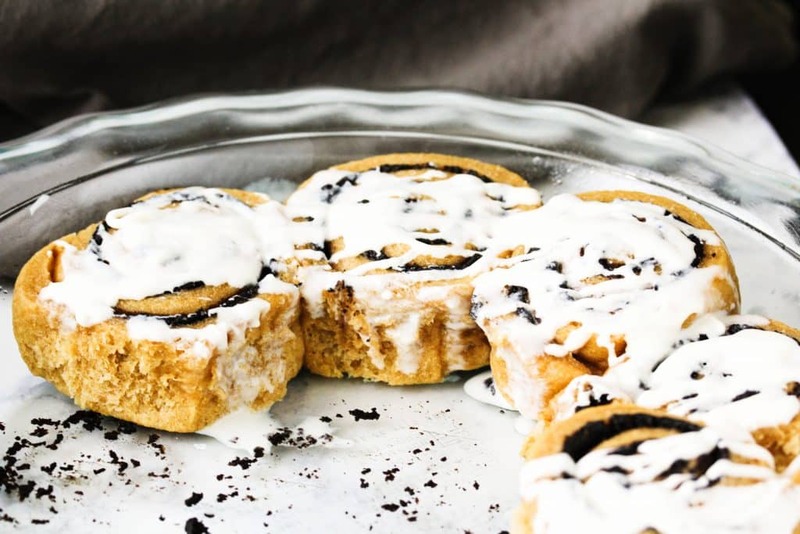 What is it about cinnamon rolls that are so good? Is it like how food on a stick is just so much more fun to eat….and so are rolled up foods? I’m going to guess it has more to do with the soft, light, fluffy, doughy rolls. And these have a sweet, slightly almondy, chocolate cinnamon filling. 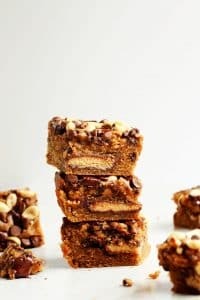 And if that wasn’t good enough, they’re packed with whole grains and healthy fats! Well, because I’ve made all the mistakes for you and am sharing all my tips on how to not end up with a dry, dense, swirly hockey puck for a roll. This is really the make it or break it step. If the yeast doesn’t proof right your dough isn’t going to rise like it should and become luscious and pillowy soft. To get it to rise correctly you need you liquids to be the right temp. If you have a thermometer you want that to read between 105 – 110 F. If it’s too cold the yeast won’t activate and if it’s too warm you might kill the yeast off. But if you don’t have a thermometer (like me) just use your finger! Stick your finger into the liquid and if you don’t feel the temperature of the water surrounding your finger then you’re at the right temp. Basically what it’s telling you is that the water is close to your body temperature and that is close enough to the 105 – 110 F range to work. Nice, frothy, bubbley yeast is what you’re looking for. Once you get all the dough ingredients worked together the dough needs to be well….kneaded. I do this by hand but if you have a standing mixer you can definitely use the dough hook. Or just spend the next 10 minutes working out all your frustrations into your dough 😉 . When kneading the dough by hand, just press the heel of your hand into the dough ball and push away from you. Then fold the dough back over on itself. Keep doing this while rotating the dough every once in a while. But also feel free to pound on it, punch into it, squish and squeeze it. Like I said – free therapy! Delicious, doughy, therapy. This one’s pretty simple – walk away from the dough and let it go to work! The important part is covering the bowl the dough is in and placing it in a warm, draft free place. That can be next to a window but away from an air vent, under a lamp, on top of the fridge, in the oven with the light turned on (but not the oven on), or my fave – in the microwave (also not turned on). You’re looking for the dough to double in size, which typically takes about an hour. Then just give it a good knead for about 1 min. and roll it out into a rectangle shape. Here comes the chocolate filling part! It’s going to be hard, but try not to eat it all by the spoonful. Because cocoa powder is pretty absorbent, I found it was best to roll out the dough into the rectangle shape first, then mix the ingredients for the chocolate filling together. If you mix first then roll out your dough, the filling could set up a bit and be a little harder to spread (like what happened in this pic). Is it weird I think this is the fun part? It’s ok for an adult to enjoy playing with their food, right!? 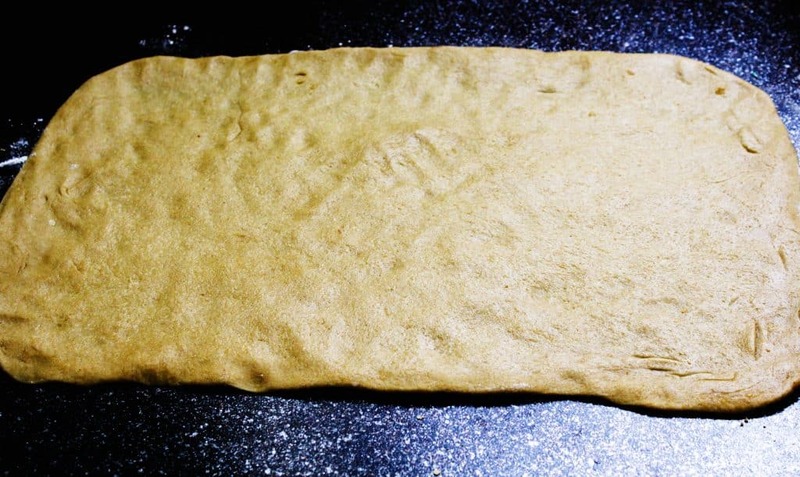 Anywho…starting at the long end of the rectangle, which should be closest to you, tightly roll the dough up away from you. To cut it into rolls, the easiest and cleanest way is to use some thread or unscented floss. Just slide the thread/floss under the roll, cross the ends over the top of the log, and then keep pulling the ends away from each other. It makes the perfect, clean slice every time! Then pop those babies into the greased pan you plan on baking the rolls in, cover them up, and let them rise again. This rise usually takes about 45 min. for them to double in size again. 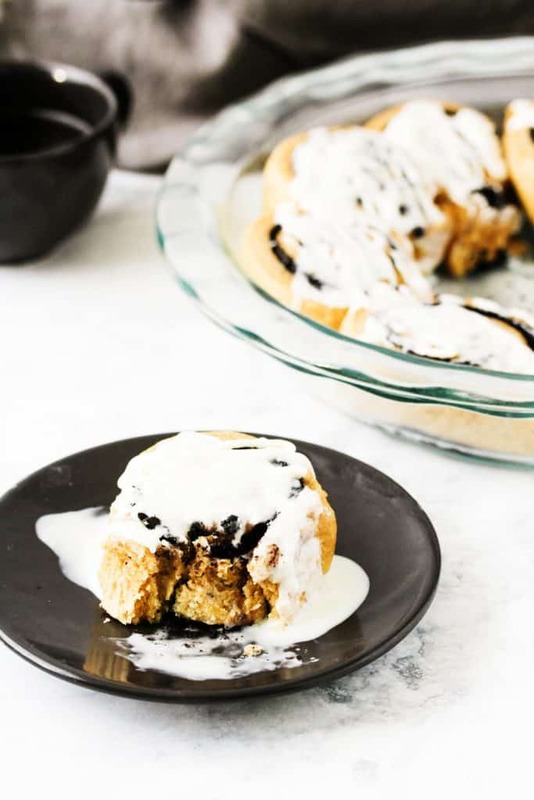 Once they’re nice and puffy, just pop them into your preheated oven and you’re a few minutes away from deeeeeelish, pillowy, doughy, fluffy, chocolate cinnamon rolls. They’re definitely best warm and even better if you pour the glaze over them while they’re still warm. 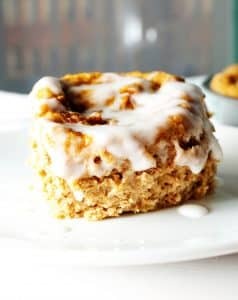 I mean, what’s a cinnamon roll without some glaze!? 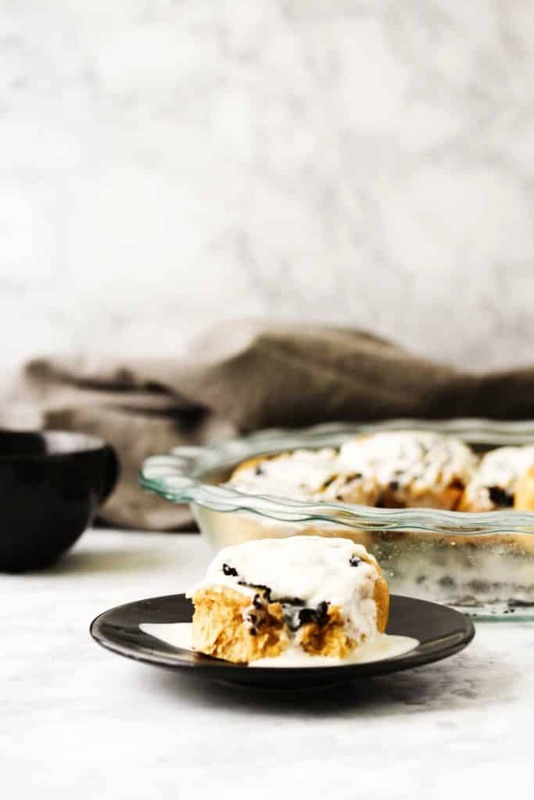 This is a recipe you won’t want to miss! 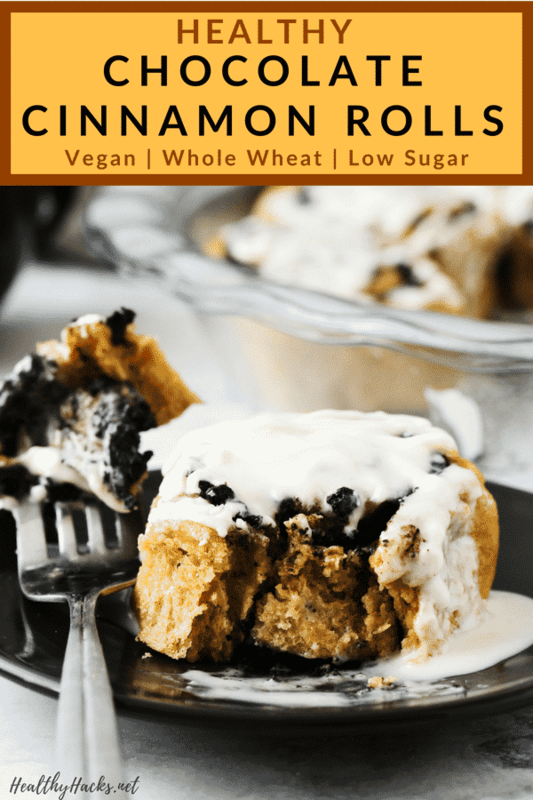 Plan on baking these healthy vegan whole wheat chocolate cinnamon rolls up this weekend for sure! In a microwave safe mug, warm the water and milk until 105F – 110F. If you don’t have a thermometer, stick your finger in the liquid and if it doesn’t feel hot or cold, you’re at the right temp. Add the 1 tsp of sugar and active dry yeast to the warm liquid and stir. Set aside for 5 minutes while the yeast foams up. 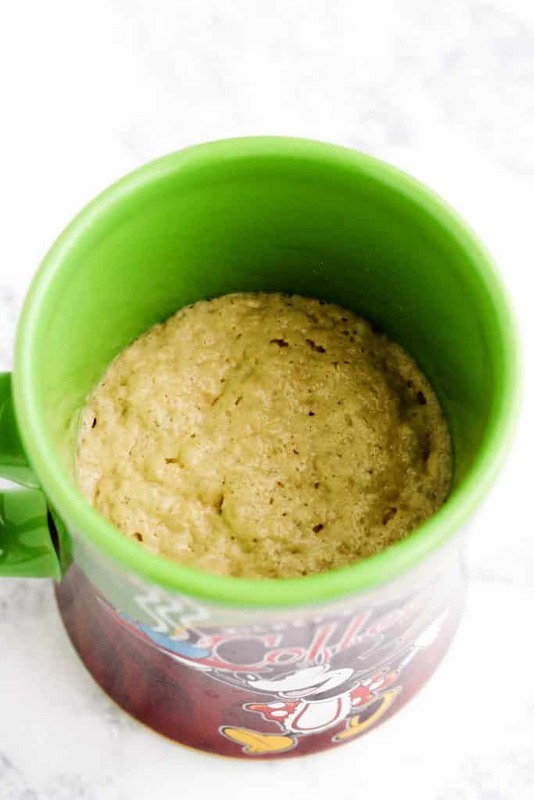 If the yeast doesn’t foam, Do Not use that yeast mixture! Try again, checking the expiration date on the packet and adjust the temp of your liquid. While the yeast is proofing, add the white whole wheat flour, all-purpose flour, sweetener of choice, baking powder, and salt. Whisk together. Add the almond butter and vanilla extract. 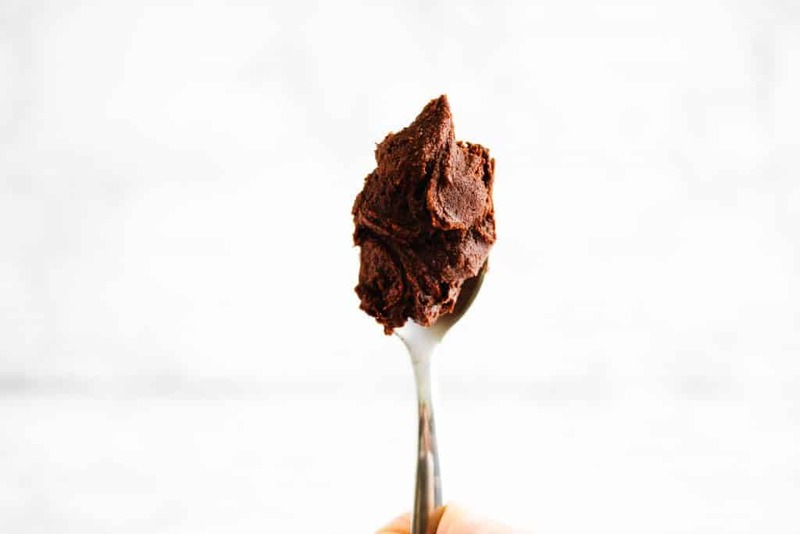 Using the tines of a fork or your hands, incorporate the almond butter into the dry ingredients until small sand-like pieces form. All of the dry ingredients won’t be incorporated, but there shouldn’t be any large lumps of the almond butter left. Once the yeast is foamy, mix it into the dry ingredients. Add a dusting of all-purpose flour to you work surface. Turn out your dough and knead for about 10 minutes by hand. Add more flour as needed - you’re looking for the dough to be smooth and not sticky. If you’re unsure if you’re dough is kneaded enough, it’s better to keep it on the stickier side than add too much flour and make the dough dry. Grease the mixing bowl you just used to make the dough (you can use oil or non stick spray). Form your dough into a ball and place in your greased bowl. 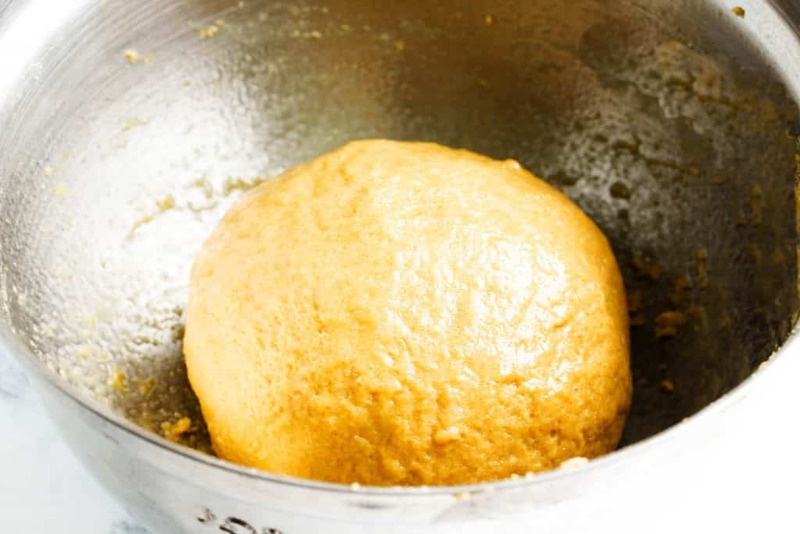 Roll the dough around a bit to get some of the oil all over the dough ball which will help it from forming a crust. Cover the bowl with cling form and place in a warm, draft free place. I place mine in the OFF microwave. Let the dough rise until it’s doubled in size. This will depend on the temperature of your home, but it should take about an hour. Once the dough is doubled in size, turn the dough out onto your well floured surface and knead the dough for about a minute to release some air. Using a rolling pin, form the dough into a 15”X9” rectangle, with the long side closest to you. Grease a 9” round cake pan or an 8”x8” square pan. 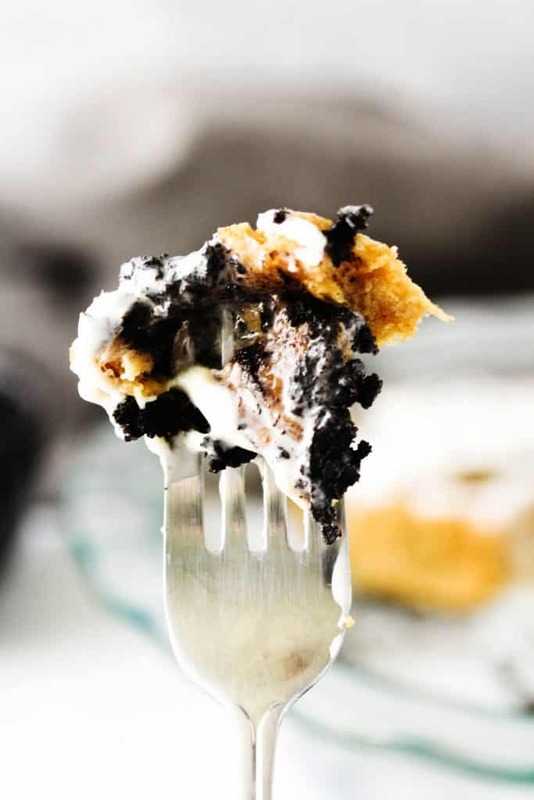 In a medium bowl, mix the almond butter, cocoa powder, maple syrup, cinnamon, vanilla extract, and salt together for the filling. 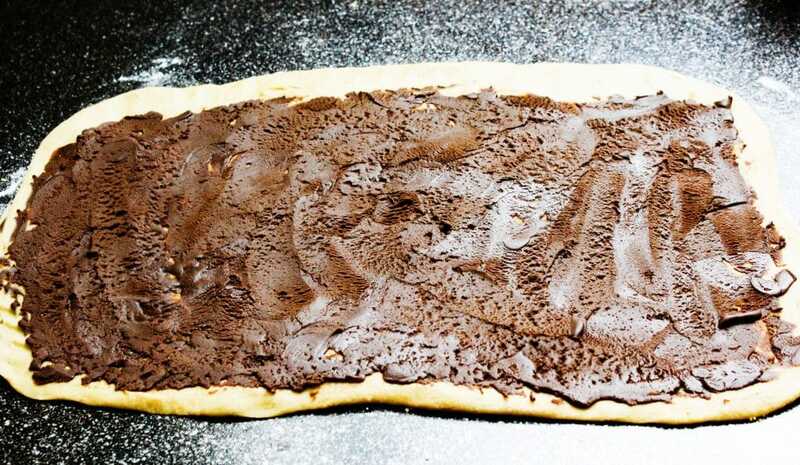 Spread the filling evenly over the dough, leaving ¼” border at the top of the dough (the long side farthest away from you). Starting at the long side closest to you, roll the dough up away from you, making sure to roll tightly to avoid the inside rolls from separating and making gaps when baking. Cut the log into 12 equal sized rolls. My favorite method is using a piece of thread or unscented floss – slide it under the dough, cross each piece over the top of the dough as if you were going to tie a bow but just keep pulling each end so the string cuts straight through the dough. Makes a perfectly smooth cut every time! Place each roll into your prepared pan with the pretty, rolls side up. Space each roll out so they aren’t touching each other. Cover the pan with cling form and place back in your warm place to rise again until almost doubled in size. This usually takes about 45 min. – 1 hour. 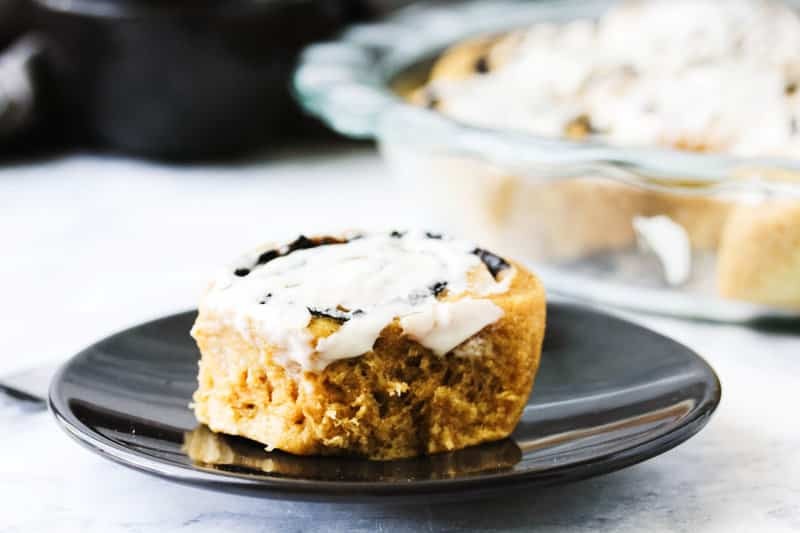 Once the rolls have doubled, preheat the oven to 350 F.
Drizzle on the glaze and serve these healthy vegan whole wheat chocolate cinnamon rolls up! They’re best served warm, so enjoy! Step 20 NOTE: Glass pans will bake the rolls faster than metal, so depending on which you use keep that in mind. Step 22 NOTE: you can sub the protein powder with more powdered sugar.